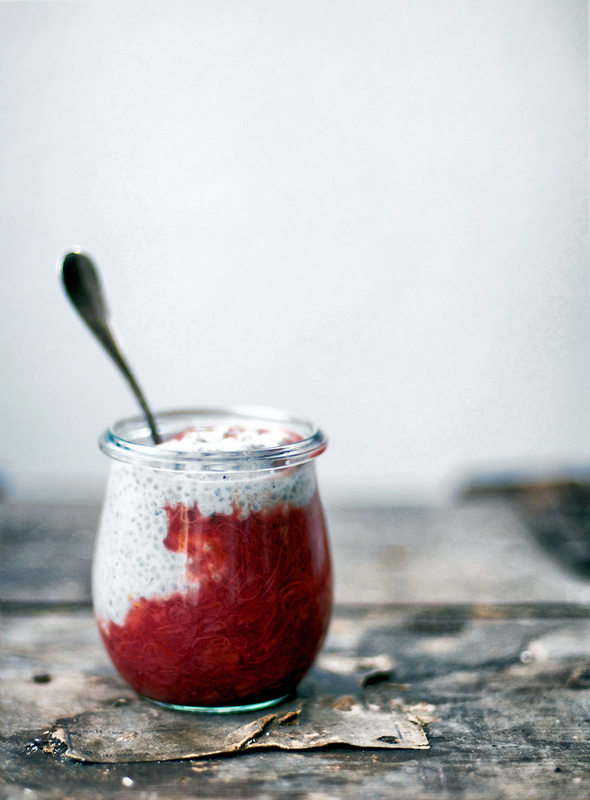 Rhubarb chia pudding with a creamy coconut milk base and rhubarb compote. This sweet seasonal breakfast works just as well as a dessert and is a nice way to use spring rhubarb. This is a really simple seasonal recipe and even though part of me doesn’t want to use my now rarer (because I have to buy it) (which is the worst) rhubarb for a recipe like this, I can’t seem to stop making it. For me, it’s a necessity to combine fruit with otherwise boring-as-hell chia pudding. I know there are people who swear by it and eat it every day, but I just can’t bring myself to eat plain, seedy mush without anything fun in it. BUT as a fruit on the bottom treat, with one of my all-time favourites, rhubarb, I want to eat it every damn day. As an added bonus, this is made with coconut milk, because any other milk is watery and bland in chia pudding. Make sure you get some rhubarb mixed in with every bite. 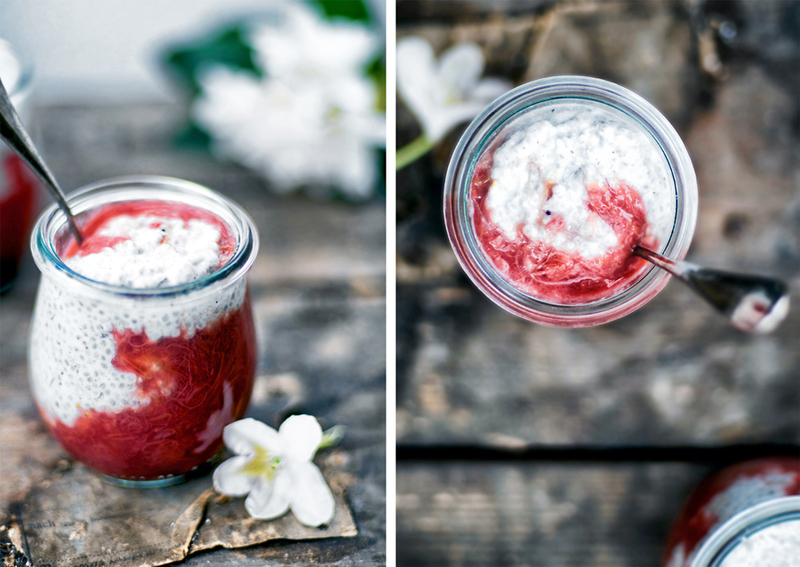 This rhubarb chia pudding is so easy that I don’t really need to talk about it much. 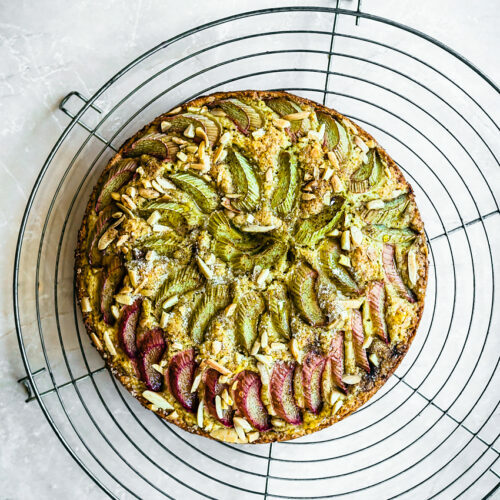 You can use any type of fruit you like in the base if you don’t have/don’t like rhubarb. Strawberries, or any berries, would be great. So would plums (yes) and other stone fruits. If you live in the southern hemisphere, you could switch out the lemon zest for cinnamon and use apples or pears. 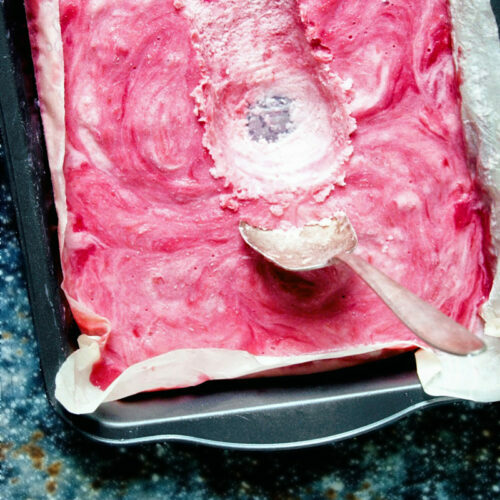 To get the pretty darker red colour of the rhubarb compote, either make sure to use rhubarb that’s red on both the outside and inside, or add some frozen raspberries when it’s cooking. I make the two components separately, and then assemble it right before eating so that the chia pudding doesn’t turn watery from the rhubarb. 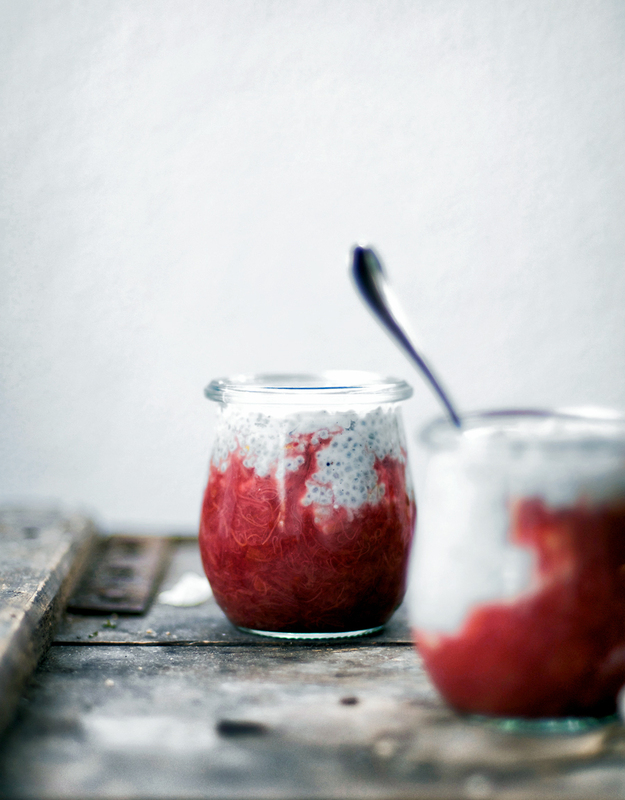 The rhubarb compote will keep in the fridge for a week or two, and the chia pudding for 3-4 days. The recipe is for a smaller batch, but you can easily double or triple it keep it in the fridge for a few days so you have a snack ready whenever you need it. Keep in mind that the rhubarb compote has to be made the night beforehand to allow it to cool before serving (I’ve made that mistake, warm chia pudding is the worst). 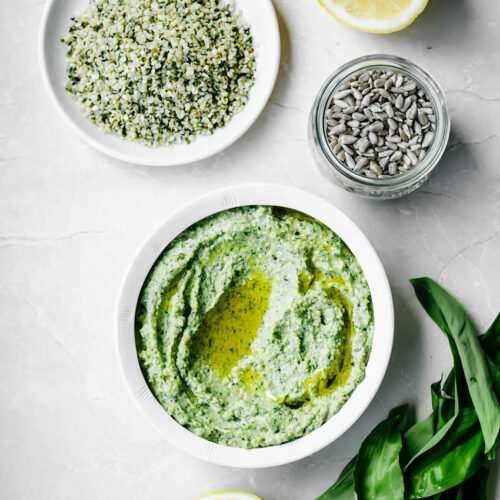 We all know the health benefits of chia, and there are plenty of healthy fats in this treat to help with healthy skin, shiny hair, and increased energy. If you’re not a fan of the texture of chia pudding but want the health benefits, try my blended chocolate orange chia parfait instead. In a container or jar, combine all of the ingredients and whisk together with a fork. Refrigerate for at least an hour, and mix it again before serving. 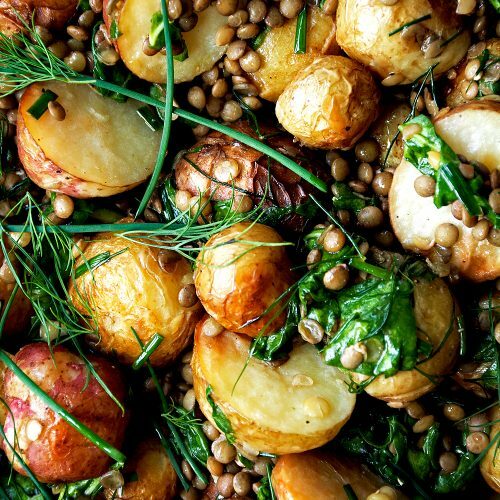 Place all of the ingredients into a small saucepan and heat on medium. Simmer until the rhubarb is soft, about 5-10 minutes. You can blend it with an immersion blender to make it smoother if you'd like. Cool completely before adding to the chia pudding. * Don't use the coconut cream from the top of a can - either use lower fat coconut milk, or combine some of the water with the cream to make a thinner milk, the consistency of whipping cream. Pretty! Love the combo of red and white colors. The red color of the rhubarb is amazing! If I was in Italy I would have to buy rhubarb as well, and it wouldn't be an easy task, but here, these days, we have rhubarb growing in my in-law's backyard, plenty in the farmers markets, grocery stores, and friends that hand you some because they have too much. Love your recipe, and how it turns a "boring" chia pudding to something very delectable! What a perfect way to jazz up chia pudding! This looks incredibly satisfying. I’ve been paroosing your beautiful website, what a feast for the eyes! 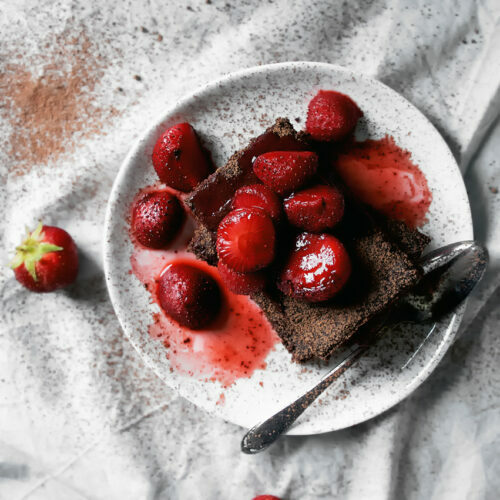 I’d love to try making this recipe – can I use pure vanilla extract in place of vanilla powder?